I nipped back down in the 6°C fog to Vines in Guildford for a first service and to get some parts fitted to the bike. 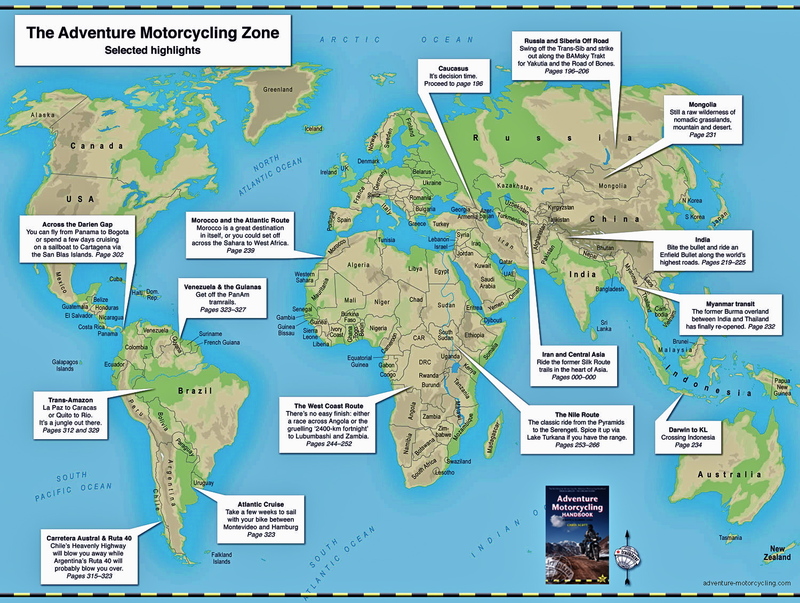 They pretty much add up to the essentials I did to the Tenere for the preceding Morocco trip: luggage rack, protection and better tyres. I also asked them to fit a 16T sprocket (I tooth less); riding out through London into Surrey I never got out of second gear, so the gearing is definitely on the tall side for town and track. On the way back through Spain and France I may refit the 17T, although removal requires a puller. On the way down I took my new friend Kanetsu, but forgot to pump it up and then on the way back I did pump it up, but realised later I’d been wearing it inside out all this time, so keeping the outside of my light jacket nice and warm. Now I know. I also removed the air vent intakes on top of the TR1 helmet and taped them up in the hope of making it quieter, but a taller screen and earplugs are really what’s needed and on the way back with a taller screen it seemed so. Replaced 17T with 16T sprocket. Metal Mule rear rack. This took some time I was told, but then so does fitting the official BM racks for the 650. Metal Mule taller screen – a good 8-inches taller than the BM high version. Metal Mule radiator guard – recommended by Paul at MM. BMW lever protectors and handguards. BMW engine bashplate and engine bars. Garmin Nuvi SatNav (alongside my Garmin 76) off a CAN bus plug. Leaving Vines the new K60s immediately felt a squirrely, though that impression wore off by the time I got home some 40 miles later. I’m expecting them to last longer than TKC, feel as good on the road and be nearly as good on the dirt. Along the M25 motorway, the taller MM screen was certainly better than the OE effort, but my feeling was it curves back too much at the top, rather than staying upright like the Tenere one – even if that one needed to TTech screen extension to be effective for me. The lowered gearing seems to have gained about 400 rpm/lost 4-5mph by losing a tooth on the front, so I’m doing around 7-8mpg at tickover in first now. Better than nothing. With the full length bash plate and engine bars, I’m hoping this bike won’t suffer the cracked crankcase my Tenere picked up one gnarly evening in Morocco last time. And the rad guard won’t do any harm, though I’ve not heard they’re vulnerable. The chunky MM rack built for their tough cases may be OTT too so will barely notice the Enduristan panniers resting against it. Once I hand the 650 back I hope to adapt that rack to fit my GS500R project bike. Next sunny day I’ll load it up with the baggage and take it all for a test ride. The Metal Mule parts were supplied in exchange for an advert in AMH6. 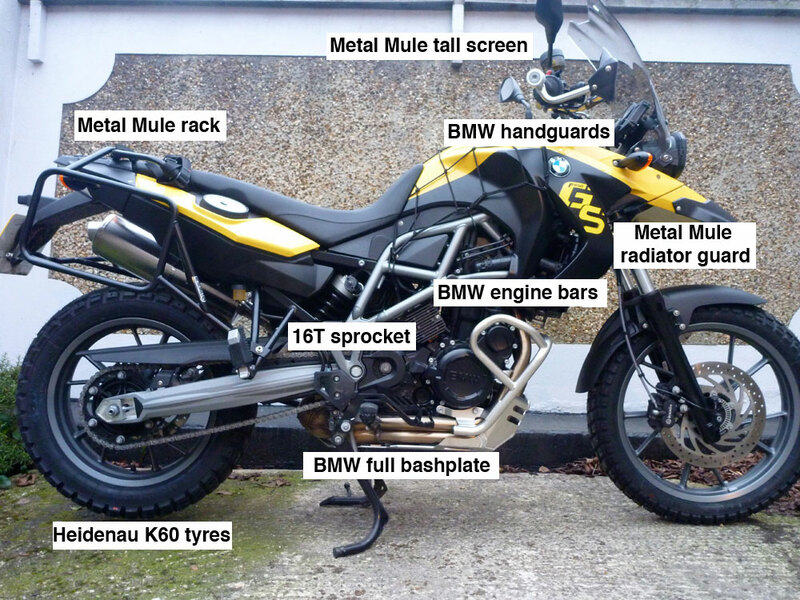 This entry was posted in AMH News, BMW F650GS SE long term test, Project Bikes and tagged Aerostich Kanetsu, bashplate f650GS, bmw engine bars f650GS, bmw handguards f650GS, Heidenau K60 tyres f650GS, Metal Mule rack f650GS, Metal Mule radiator guard F650GS, Metal Mule screen f650GS, vines of guildford. Bookmark the permalink.